Look around and get a feel for our church - both the lovely historic building we enjoy and our welcoming community of people. We would like to take this opportunity to invite you to one of our services. When you visit, you will be a respected and welcome guest. We hope you and your family will have a warm and spirit-filled experience with us as we worship and fellowship together. Click here for directions and contact details. Stained Glass Windows: Our lovely windows are featured in Frankfort's Public Arts Tour HERE. Steeple Spire: The original steeple spire was destroyed by lightning in 1939; the building was without a spire for seventy-four years. 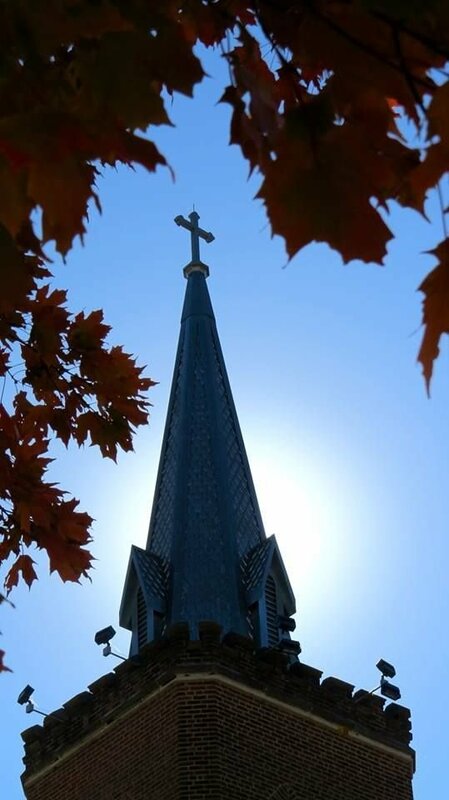 In 2013, a group of current and former parishioners, led by Mr. Winfrey Blackburn, raised funds to replace the spire. The new structure, 40 feet tall, was designed to look as much like the original as possible. 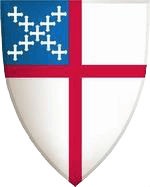 Origins: Christians of the Episcopal/Anglican tradition have worshiped on the site of the Church of the Ascension since 1836. At that time, Frankfort was a small frontier town of fewer than 2,000 souls, with streets that were often muddy and inadequately lit, no water or sanitation systems, and primitive transportation. Religious influence and churches were slow to take root in Kentucky’s capital city. Among its inhabitants was a nucleus of families from Episcopal or Church of England heritage who would travel to Lexington to worship at Christ Church, which was founded in 1776, or they were irregularly supplied by traveling or missionary priests. Benjamin Bosworth Smith, who was elected as the first Episcopal Bishop of Kentucky in 1831, often traveled to Frankfort to hold services. There he was encouraged by Anglicans in Frankfort to establish a parish in the state capital. While the Bishop was in New York City in 1835 on a quest for funds to support his dream for a seminary and the establishment of new churches in Kentucky, the ladies of the Church of the Ascension in Greenwich Village gave him $1,000 for the establishment of an Episcopal Church in Frankfort. He also recruited a highly educated young man named Henry Purviance to move to Lexington to attend his new seminary. The Frankfort Episcopal Church began in a small law office, and the $1,000 gift was used to construct a small wooden frame church in the Greek revival style modeled after its benefactor church in New York City. It was also named after the church whose generous women had helped finance its construction. In 1836, the church was built on Washington Street, close to its intersection with Broadway, then the main street of Frankfort, where a new classical-styled Kentucky marble state capitol had been built in 1829. In early 1836, Purviance was presented to Frankfort as an Episcopal “missionary.” Like other early Frankfort churches, Ascension’s beginning was full of promise but marked by recurring financial challenges. One of the most influential early rectors was John Nicolas Norton, who served from 1846 to 1870. Under his leadership the church grew rapidly. With the financial support of John Harris Hanna, a prominent lawyer and the first president of Farmers Bank, Norton established free schools for the poor, an orphans’ home for girls, and founded churches in Versailles and Georgetown. During the Civil War the church remained united. After the war, the Rev. Norton assisted in starting a school for African-American children. In 1870 Norton and his family moved to Louisville. At his death, his wife donated their Jefferson County property to establish Norton Infirmary, the forerunner of today’s Norton Healthcare System. The current gothic revival church building was begun in 1848, completely paid for with a gift of $20,000 from John and Mary Hanna, as always stalwart supporters of the church. The building was completed in 1852. In 1868 the apse and transept were added. The parish house was constructed in 1899, and the education wing was added in 1967. The original wooden church remained in use for Sunday school and other classes until it was razed in 1900. The Church of the Ascension has occupied the same site for more than 175 years. Throughout its history, Ascension has continued the example of John Norton and other early leaders by providing Christian witness and help to those outside its doors who are in need. The above information is drawn from two sources: an excellent history, Ascension Episcopal Church, Frankfort, Kentucky 1836-1996, by Charles R. Hinds, a long-time member of Ascension (copies are available in the church library); and A Walking Tour of Historic Frankfort, with text by Russell Hatter and photography by Gene Burch. The latter can be further explored at <www.geneburch.com>.